If you reach High City with the Funicular you enjoy a unique view and just come down, you only have to make 50 steps, and you're here. The apartment is located in a quiet area, parallel to the shops. The less known, but more fascinating because it leads to Old Square and Santa Maria Maggiore from the magical side of the High City. The apartment is ideal for a romantic couple or for a family with children. As soon as you enter the door you breathe the air of the noble houses of the historic village. Get a stairway that looks out over the pretty inner courtyard and you've arrived. Inside you have everything you need to feel at home: a kitchen with a window, a fireplace, a small bathroom (remember it's small but essential), a living that borders the room. In the midst of a true restored 1950's. Just say that it is the quarters where Finicolare arrives, in the splendid "7-way" square called Piazza Shoes Market. At the beginning of High Town, in the most impressive quarter of the entire historic village. In the square you will find two outdoor bars, a restaurant, a pub, a takeaway pizzeria, and an ice cream parlor. 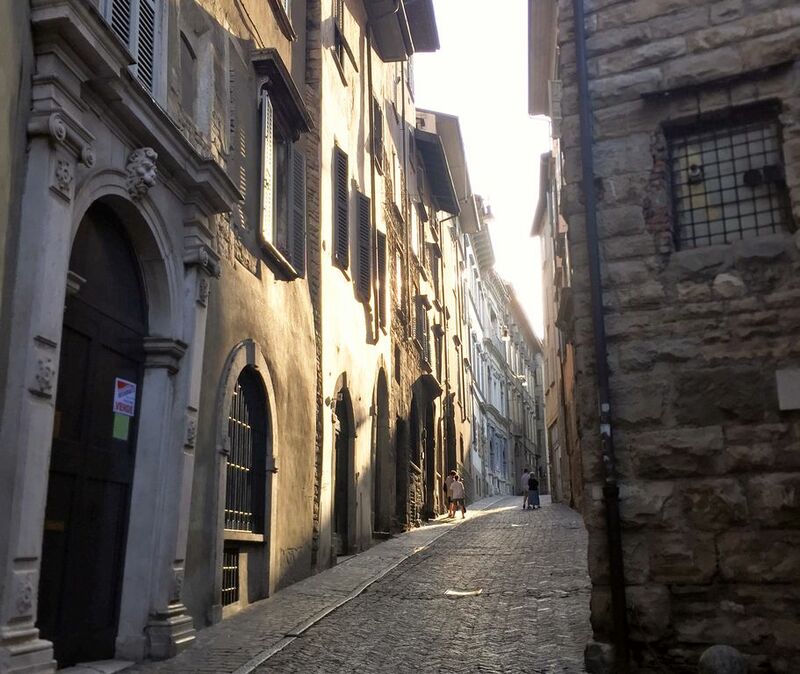 You will be 100 meters from Bergamo's Rock, 100 meters from Piazza Vecchia, 100 meters from the Duomo, Santa Maria Maggiore and the Colleoni Chapel, 100 meters from the Venetian Walls. Hence the name of our home. You will always meet people of all nationalities. You will stay in the side street, the quietest, the least crowded, the few that you know, but also the most magical. You will be 50 steps from the Funicular where you can also take the bus to the station and from there take the train or the Shuttle to the Airport. Very easy. The house is in the best served place in the entire Upper Town. You can enter the historic center (ZTL area) with your car, thanks to the car permit you will be issued upon your arrival. The house is in the historic center and then once parked or once you arrive, you will already be where you need to be. Everything can be reached with a walk. Ich habe in der sehr schön in Altstadt gelegenen Wohnung eine ruhige Woche in der Adventszeit verbracht. Die Vermieter kümmern sich rührend. Just say that it is the quarters where Finicolare arrives, in the splendid "7-way" square called Piazza Shoes Market. At the beginning of High Town, in the most impressive quarter of the entire historic village. In the square you will find two outdoor bars, a restaurant, a pub, a takeaway pizzeria, and an ice cream parlor. You will be 100 meters from Bergamo's Rock, 100 meters from Piazza Vecchia, 100 meters from the Duomo, Santa Maria Maggiore and the Colleoni Chapel, 100 meters from the Venetian Walls. Hence the name of our home. You will always meet people of all nationalities. You will stay in the side street, the quietest, the least crowded, the few that you know, but also the most magical. You will be 50 steps from the Funicular where you can also take the bus to the station and from there take the train or the Shuttle to the Airport. Very easy. The house is in the best served place in the entire Upper Town. You can enter the historic center (ZTL area) with your car, thanks to the car permit you will be issued upon your arrival. The house is in the historic center and then once parked or once you arrive, you will already be where you need to be. Everything can be reached with a walk.